In this article we’re going to conduct a laboratory experiment. All you need is your finger and your eye. And when we’re done, you’ll have yet another fun anatomy and physiology fact filed away. First, a little background. Think back to that eighth grade health class – or whatever science class in which you first studied about how the eye works. Remember those diagrams about how the lens flips an image upside-down onto the back of your eye? So light strikes the back of your eye – the retina – and sends a signal along the optic nerve (cranial nerve II) to the back of the brain, to the primary visual cortex, where the signal is sorted out again so that you ‘see’ everything right side up. But, the lens in your eye doesn’t just flip the image upside-down, it also flips the image along the left-right axis. In other words, what you’re seeing on the left, is actually hitting the right side of your retina. Another thing sorted out effortlessly by your visual cortex. Here’s a quick diagram to help. 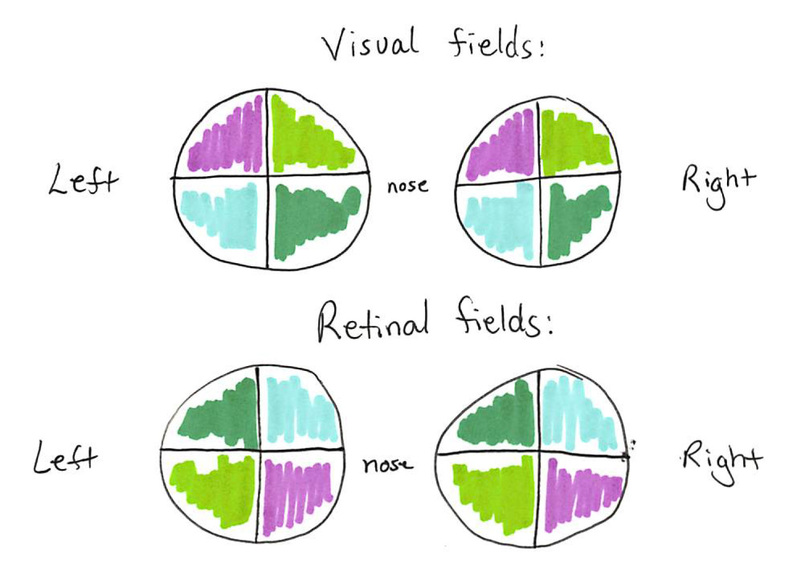 Visual field is what you’re seeing. 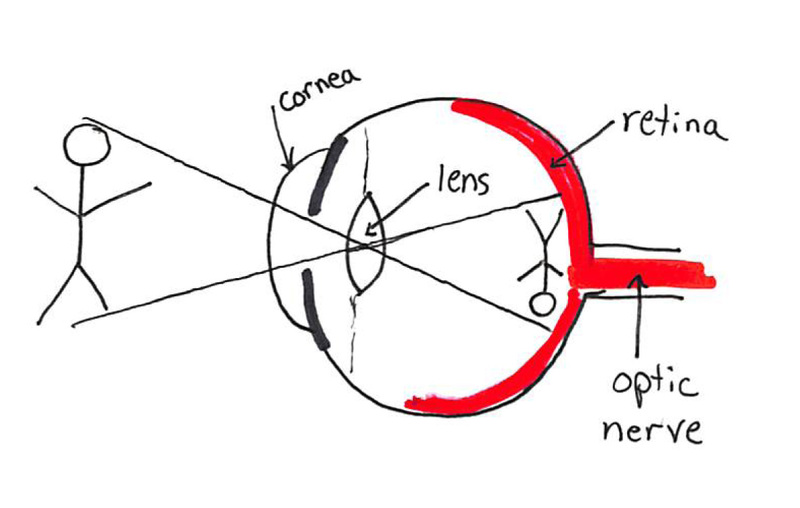 Retinal field is how that image is projected onto the back of your eye. Got it? Now it’s time to level up and talk about the optic chiasm. En route to the back of your brain, the optic nerve fibers do a kind of criss-cross at a structure known as the optic chiasm. 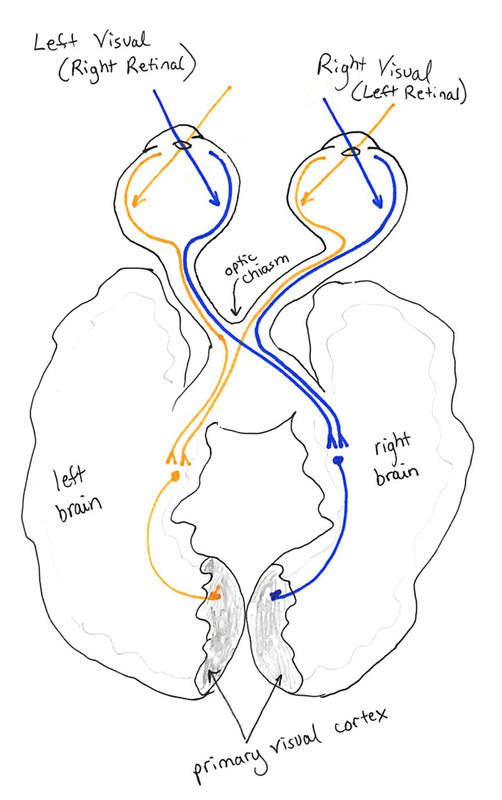 Here, nerve fibers from the right half of the retinal field go to the right side of the brain, and the left half of the retinal field heads for the left side of the brain. Why bother with all this? Well, this whole criss-cross, left-right moving about of nerve fibers may seem odd, but it is the key to providing us with depth perception. In any case, the brain takes this information and processes it, sorting everything out and providing us with the ability to see our environment as it actually is. Okay. Now we’re ready for the laboratory experiment. Normally, we ‘see’ light that has passed through the lens of our eye. But for our laboratory today, we are going to ‘see’ touch. Here’s the experiment: Close your eyes. Pick one eye. Now poke (firmly but, please, not out) the left side of that eye. Where do you see a flash of light? Did you ‘see’ a flash of light or a kind of dark shadow on the right side of your eye? Now poke the right side and watch for the flash on the left. You by-passed your lens, meaning that you skipped past that whole first diagram above. Instead, your retina registered a mechanical impulse and sent a nerve signal along your optic nerve, through the chiasm to the visual cortex… and your brain flipped it… and you ‘saw’ touch on the opposite side.